The topic for week two of the School for Change Agents, which was broadcast live on 22nd February, was change agency. We define this as: the power, individually and collectively, to make a positive difference. It is about pushing the boundaries of what is possible, mobilising others and making change happen more quickly. This is a situation we have seen before. 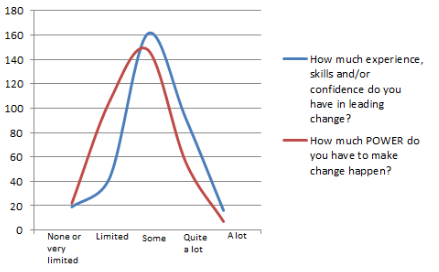 Change agents often report that they have the skills and knowledge but are less sure about their own agency for change. Most of the training that is available for people who lead and facilitate change focuses on specific skills, methodologies and approaches. Change agents need this kind of development but on its own it is insufficient. 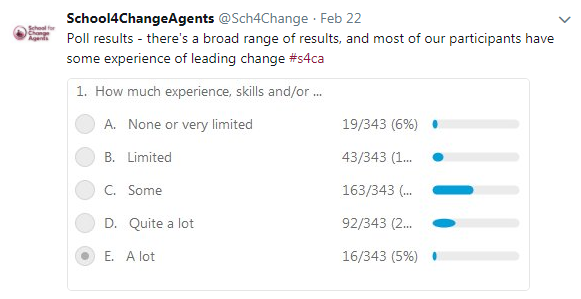 If we utilise the definition of power suggested by Bertram Russel – “one’s ability to achieve goals”, then change agents also need to focus on building their own change agency in order to be powerful agents of change and achieve the results they seek. Connected to this is the distinction we make in the School for Change Agents between DOING and BEING change (and again effective change agents need both). DOING is about having the skills and methods to enable change. BEING is about the inner place from which change agents operate in the world and is demonstrated through their visible behaviours; how they build interdependencies with others, live with tensions and mobilise through values. 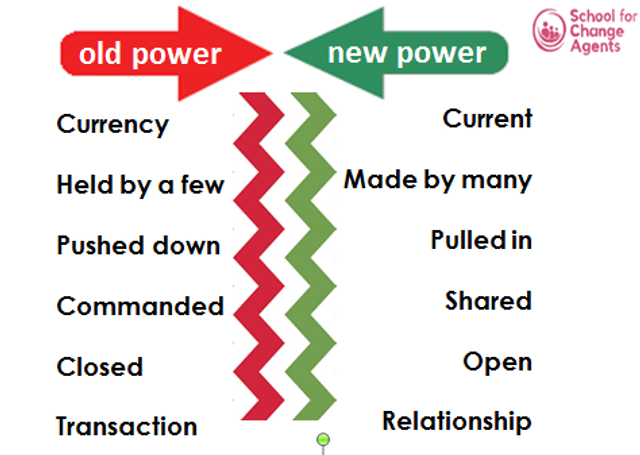 Old power is positional power in an organisation or system. In an old power world, the people who can make change happen are those with the authority to push commands through the system. Old power is like a currency; some people have a lot of money but most people don’t. Largely, old power is transactional. People are held to account in a rational way for performance agreements and quality standards. By contrast, new power is like a current; it surges with energy when people come together with a shared purpose. The more that people participate, the more power is created. New power is relational; people engage in new power ways because they want to and it fits with their own priorities and values, not because they have to. Grass roots change agents shouldn’t assume that old power is “bad” and new power is “good”. The most effective campaigns and action groups work with both kinds of power. If we consider the great social movements that changed the world, such as the women’s suffrage movement, environmental campaigners and the civil rights movement, one characteristic they all share is that they were able to operate in what I call the difficult "zig-zaggy space" between old and new power. Change agents need to be able to operate with the levers and opportunities of both kinds of power. Neither should we assume that old power outplays new power. People often say to me “I can’t make change happen. I’m only a staff nurse/student/junior doctor/middle manager”. Yet research findings suggest that, in terms of being an effective change agent, the extent to which a person is at the centre in the informal network (new power) is significantly more important than their position in the formal system (old power). In addition, people who are highly connected have twice as much power to influence change as people with hierarchical power. If we look at the reasons why large scale change projects fail to achieve their objectives, the reasons are complex and multiple. However, the failure is less likely to be about old power issues such as the programme management system, formal accountabilities and the structure of the plans that are put into action. Failure is more likely to be about lack of engagement with the informal networks that can make or break the change. If we want to make big change happen, we need to think new power as well as old power, connecting with networks of people who ‘want’ to contribute. The last time that my team, NHS Horizons advertised a vacancy for a senior role, 70 change leaders from the English National Health Service applied for the job. We analysed the applicants and found an interesting pattern. Most of the applicants held roles in healthcare improvement but they were positioned in what Henry Mintzberg would call the “technostructure” of their organisations. This meant they were positioned in technical advisory roles, away from the locus of organisational power, which is known as the “operating core”. The reality is that however experienced or skilled these improvement leaders are, if they are away from the real power, they aren’t in a strong position organisationally to make much impact on the real work of their healthcare organisations. So if you are part of a specialist improvement team or in a corporate improvement, innovation or programme management unit, you might need to work especially hard and reach out across boundaries to build the new power relationships and influences necessary for systemic change. It’s worth considering whether you can build dotted line organisational connections with teams in the operating core. Gaining power as a change agent doesn’t usually happen overnight. You might suddenly acquire power because you are promoted to run a large scale change project with a big budget, or get elected to office, but even then you have to build trust, respect and relationships over a period of time in order to have real power for sustainable change. 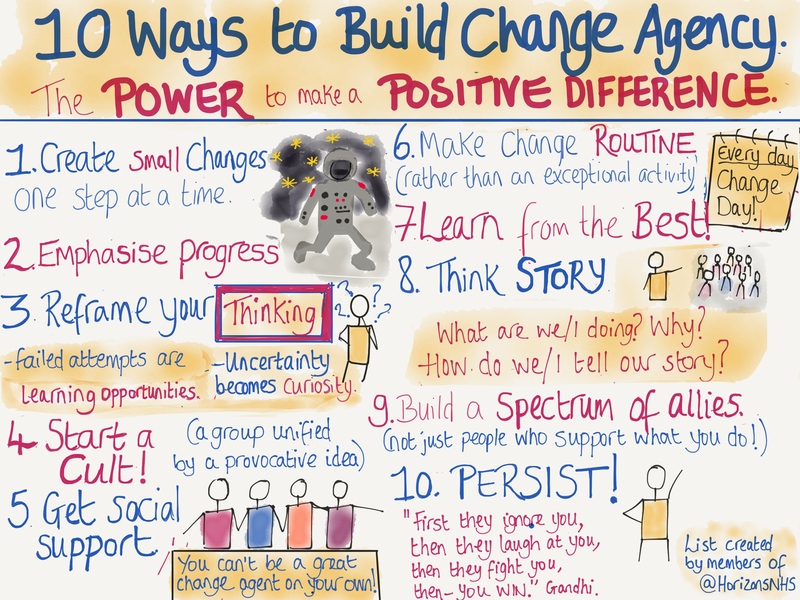 Leigh also wrote a blog explaining the methods for building change agency that are shown in the sketchnote. You can read it HERE. My experience is that building change agency is like making a series of marginal gains. The basic idea of marginal gains is that small incremental improvements in any process can add up to a significant improvement when they are all added together. Just as marginal gains thinking has revolutionised elite sport it can help build change agency on a very big scale. We can build our own power for change by making small gains on many fronts simultaneously, underpinned by consistent visible behaviours that show people our values and goals for change. There are two particular aspects that I would like to highlight. The first is to never underestimate the power of small wins. Sometimes when we are leading large scale change initiatives, we feel under pressure to make big things happen. Yet making small scale changes is one of the most effective ways to build a sense of hope, possibility and confidence, both for yourself and in other people. Being a change agent who makes even small things happen is far more likely to result in change agency than being someone who plans change and/or just talks about it. The second aspect is if you want to build your change agency in a "new power" way, you must always, always following up on promised actions. To quote a wise Dutch proverb, “Trust comes in like a tortoise and goes out like a horse”. It takes a very long time to build the trusting relationships that are the foundations of effective change but trust can be lost very quickly if promises are not kept or expectations are not met. If people give their time and energy for change freely in a new power world and they are disappointed, why would they choose to give it again? More than anything else, change agency is about building trust and maintaining it. I hope that The School for Change Agents is meeting your expectations and helping you to ignite action and initiate small wins. There is still time to join the school (and catch up) if you haven’t done so already. You can sign up HERE.